Optional sensor for models 200/200P. Creates and electronic forcefield around motorcycle for enhanced protection. Adjustable range, remote controlled on/off function and countdown warn away function. 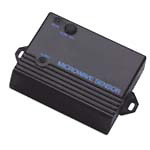 When purchasing the Proximity Sensor for Motorcycle Alarm, consider the other items listed below. You can add all desired items from below at one time by clicking the Suggested Items Add Page link.